This state-of-the-art volume reviews both past work and current research, with contributions from internationally recognized experts. The book is organized into fourteen chapters and designed to embrace the full range of terrestrial geochemical sediments. David J. Nash is Reader in Physical Geography at the University of Brighton. He is widely known for his publications on the links between silcretes, calcretes and landscape evolution in southern Africa, southwest Europe and the UK, as well as his broader research into the geomorphology of dryland regions and Quaternary to recent environmental changes in deserts. Sue J. McLaren is Senior Lecturer in Physical Geography at the University of Leicester. Her research expertise is in terrestrial geochemical sediments (particularly aeolianites and calcretes), reconstructing palaeoenvironments in drylands, and geoarchaeology. Sue has worked extensively in northern and southern Africa, the Middle East, Mexico and the Caribbean, as well as in the Mediterranean and Borneo. 1. 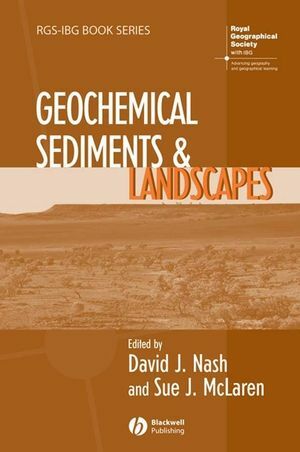 Introduction: Geochemical Sediments in Landscapes (David J. Nash and Sue J. McLaren). 2. Calcrete (V. Paul Wright). 3. Laterite and ferricrete (Mike Widdowson). 4. Silcrete (David J. Nash and J. Stewart Ullyott). 5. Aeolianite (Sue J. McLaren). 6. Tufa and travertine (Heather A. Viles and Allan Pentecost). 7. Speleothems (Ian J. Fairchild, Anna Tooth, Andrea Borsato and Silvia Frisia). 8. Rock varnish (Ronald I. Dorn). 9. Lacustrine and palustrine geochemical sediments (Eric P. Verrecchia). 10. Terrestrial evaporites (Allan R. Chivas). 11. Beachrock and intertidal precipitates (Eberhard Gischler). 12. Nitrate deposits and surface efflorescences (Andrew S. Goudie and Elaine Heslop). 13. Analytical techniques for investigating terrestrial geochemical sediments (John McAlister & Bernie J. Smith). 14. Geochemical sediments and landscapes: general summary (Sue J. McLaren and David J. Nash).